ALL NEW EXTERIOR AND INTERIOR FOR 2019. FEATURES GREY EXTERIOR AND ALUMINUM WHEELS. THIS 12' BOX WITH A DINETTE SLIDE OUT. 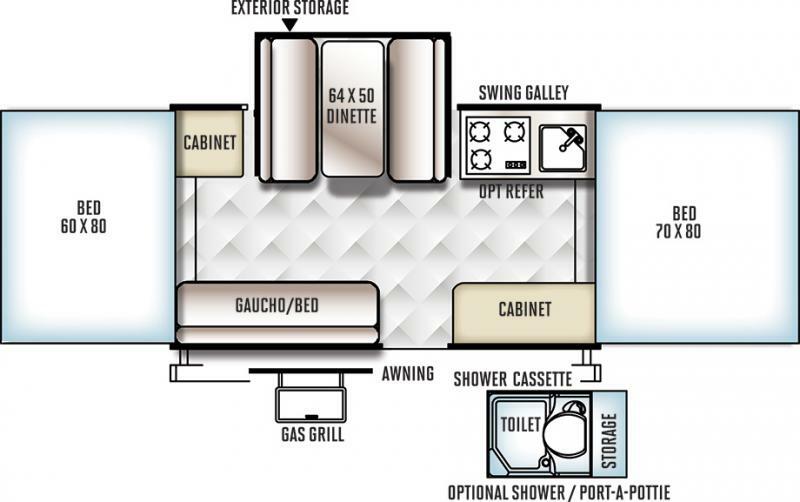 SLEEPS 8 AND FEATURES OUTSIDE SHOWER, HOT WATER HEATER, PRO RACK ROOF CARRIER, FURNACE, 3-WAY FRIDGE, POWER LIFT SYSTEM, DOUBLE GAS BOTTLES, HEATED BED ENDS, AWNING, LED AWNING LIGHTS, OVERHEAD CABINET, OUTSIDE GRILL, FANTASTIC FAN AND MUCH MORE. THIS A SPECIAL INTERNET PRICE AND AVAILABLE FOR A LIMITED TIME ONLY.